They also eat cakes, cookies, ice cream, and all sorts of tasty treats cooked up in the BAH kitchen. So is it any surprise that eventually all those food choices catch up with you? When I casually mentioned to The Mistah that I was thinking of revisiting Phase One of South Beach, because I was starting to feel a little jiggly in the middle, I expected him to say that I’d lost my mind. My previous South Beach journey through Phase One had been brutal. I went cold turkey on sugar and carbs after a lifetime codependent relationship. Like any addict denied a fix, I twitched and fidgeted. My concentration wandered. Thoughts of icy cold glasses of coke, cookies fresh from the oven, dinner rolls slathered in butter, and angel hair pasta dusted with grated Parmesan consumed me. I heard them calling to me, beckoning me to take just one bite. Somehow, I resisted the urge to use. And gradually, I got used to living without some of those things or found an alternate version of them. Cheerios? I don’t really miss you or your honey nut sweetness. Regular Coke? I’ve got fond memories of our time together but I’m with Diet Coke now. Pasta? You still have a hold over me so I try to avoid you all together. Cookies and Cake and Ice Cream? You are my downfall. My defenses are rendered ineffective against you. So it is that I find myself back at square one. I’ve relapsed with sweets and need an intervention. Hopefully the withdrawal on this trip back to Phase One rehab won’t be quite as painful as it was the first time. I don’t know if I can survive another two weeks haunted with visions of cookies and ice cream sundaes. Why can’t my hallucinations be of whole wheat bread or cheese sticks? BAH Note: I’m not going to try and kid you into thinking that I’d rather have quiche cups than waffles or cinnamon toast for breakfast. But these are a great make ahead, easy breakfast; especially when you wake up on Day One of Phase One and can’t engage your brain in actual thinking. And truthfully, if you’ve got a brunch menu to plan, these quiche cups are your friend. Just remember to spray the foil liners lightly with cooking spray. 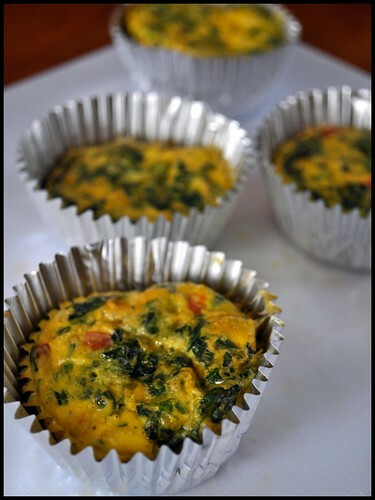 According to the SB recipe, the cooked quiche cups can be refrigerated or frozen. I don’t recommend reheating these in the microwave though. Rubbery vegetable quiche cups is no way to start your morning. Heat oven to 350 degrees and line a muffin tin with 12 foil liners. Spray the foil liners with nonstick cooking spray and set aside. Place the spinach in a microwave safe bowl and microwave for 2 to 3 minutes on high. Meanwhile, place the egg substitute, cheese, red pepper, scallion, and paprika in a medium bowl and stir to combine. When the spinach is cool enough to touch, squeeze out the excess liquid from the spinach and add it to the bowl with the egg mixture. Stir to thoroughly combine. Divide the mixture equally among the lined muffin cups. Bake for 20 to 25 minutes or until the egg is cooked and a tester inserted in the center comes out clean. This looks so amazing! I love cooking quiche in the cup like that. I will try the recipe with real eggs, it sounds healthy and delicious. Absolutely not. We need to plan another one. Well, I started with these as a gluten free breakfast for some playgroup moms who came once a month. After tinkering around I was eventually making them with full fat cheeses of all kinds, tomato slices, cream (ahhh), you name it : ) Once we even added a little old bay in true Hon fashion–not very south beach but yummy! We don’t typically use reduced fat anything. But for the SB jumpstart I think we stuck to the reduced fat cheese. Now, not so much. Ohhh, throw some lump crab and Old Bay into the mix and that would be a lovely treat.